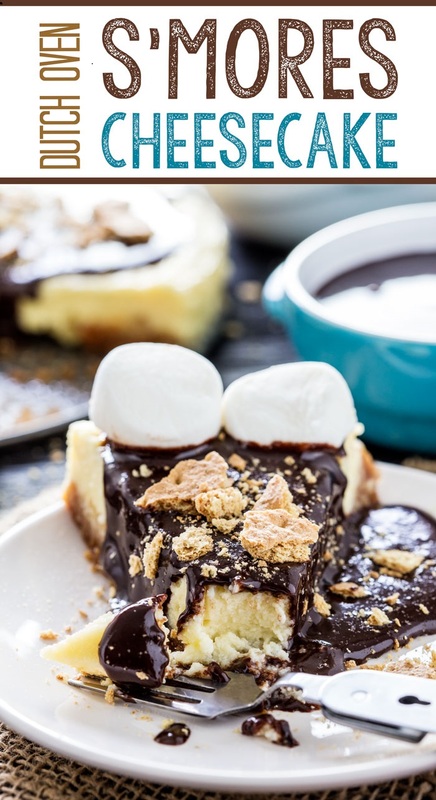 A creamy, delicious marshmallow cheesecake that you can make in a dutch oven! With a fun topping bar including chocolate ganache, Honey Maid Graham Crackers, and more! 1. Start your charcoal. Light it, and get it going so it is hot. Depending on weather conditions, make a foil tent around it to keep it hot. 6. Place 8 charcoal pieces under the dutch oven, and 12 on the lid, put the lid over the top and start heating the dutch oven and water. 7. While that is heating, mix together the filling. Use a hand mixer, or just mix really well, and mix the cream cheese and sugar, vanilla, marshmallow fluff, and heaving whipping cream. 8. When well mixed, add the eggs, one at a time, and blend until just incorporated. Do not over mix. Pour over crust into springform pan. If your pan is not airtight, put foil around the bottom edge so the water bath does not seep in and ruin your cheesecake. 9. Carefully lift the lid to the dutch oven, and place the springform inside the heated water. 10. Replace lid and let cook for about 1- 1½ hours, until no longer jiggly in center. Replace coals as needed to keep the dutch oven hot and heating evenly. 11. Once cooked, remove from dutch oven, and let cool. Then top as you wish. For me it was chocolate ganache and graham crackers.